Easter is one of those holidays that is spent with family. People will come to church on Easter (and Christmas) that normally don’t come. That is why I try to find some form of lesson that I can teach that can be easily repeated. When the kids leave church Easter Sunday morning, many of them head to family gatherings. And if they have a cool, fun takeaway from your lesson, they will be excited to share what they learned. They way I see it, we have an opportunity to turn our kids into missionaries, as well as give them the tools needed to help them share the gospel.With Easter approaching, it is that time of year when we all start looking for our Easter lesson ideas. I took a set of regular plastic Easter eggs and spray painted some of the colors I could not find. (pink eggs sprayed red and purple eggs sprayed black) I found some solid white fake eggs to included as well, but if you can’t find them, you could spray paint white as well. The red egg represents the blood of Jesus, from when he died on the cross for us. Jesus became the ultimate sacrifice for our sins. Hebrews 9:22 says that without the shedding of blood there is no forgiveness. The white egg represents forgiveness. Jesus will forgive you, all you need to do is ask. The green egg represents growth. Once we are forgiven, we need to start learning more about God, and growing in our relationship with him. 2 Peter 3:18- Grow in the grace and knowledge of our Lord and Savior Jesus Christ. The yellow egg represents heaven, where the street is made of pure gold! The moment we ask Jesus to forgive us, not only does he forgive us, but he prepares a place in heaven for us so we can live forever with him. Revelation 21:18, “The wall was made of jasper, and the city of pure gold, as pure as glass. The twelve gates were twelve pearls, each gate made of a single pearl. The great street of the city was of gold, as pure as transparent glass. 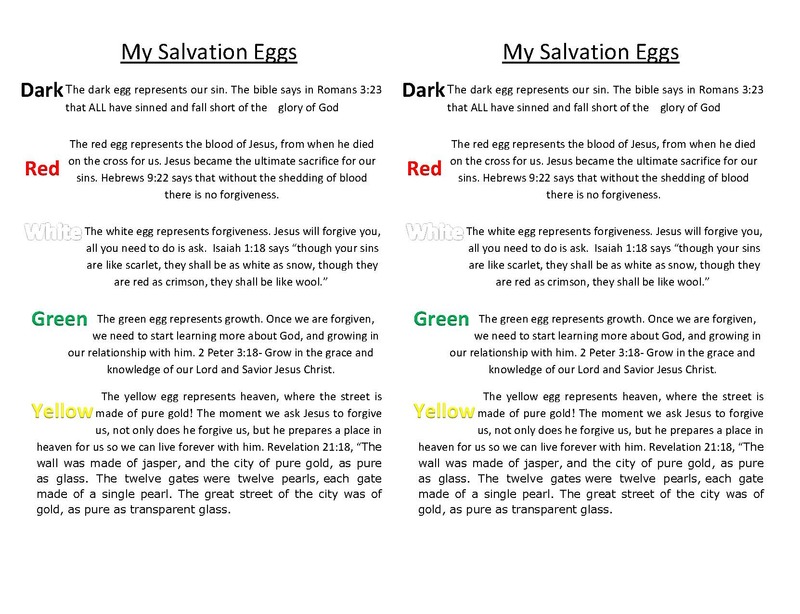 Want a printable version of the Salvation Eggs to hand out? 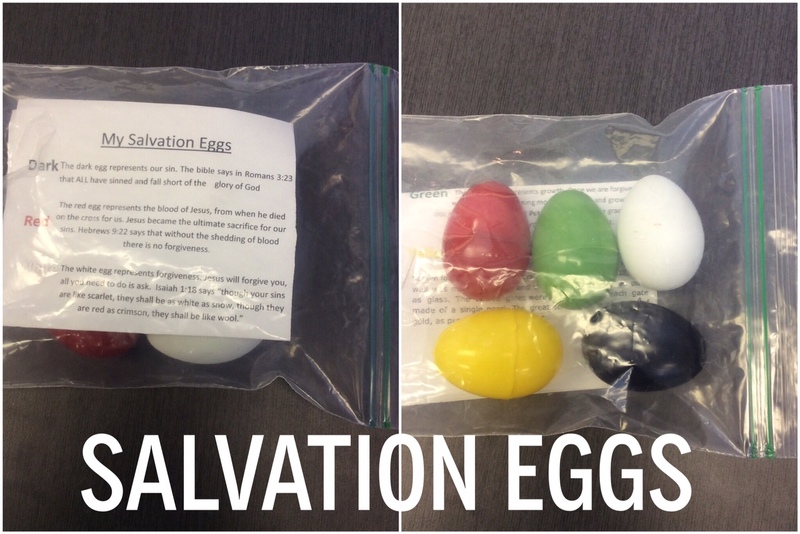 Looking for more Easter lesson ideas? Check out this list of 11 places to find quick and easy Easter lesson ideas.